Fishing Riverside County Freshwater Offers some Really Cool Fishing. Price Valid for up to Two (2) People. 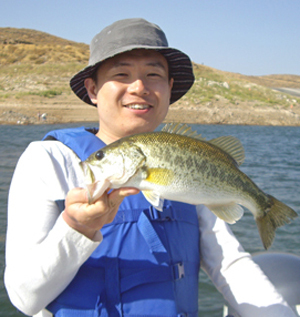 Whether you fish Riverside County for its lakes; ponds, rivers, or creeks, you are sure to have fun. If you chase Bass; Trout, Catfish, Panfish, Stripers, or Carp, there's always something to be had fishing Riverside County California. James Nelson Professional Fishing Guide Service will not only guide you to the best fishing in Riverside County, but we also supply you with all the necessary baits; lures, tackle, rods, reels, snacks, and soft drinks, to help make your San Diego Area Freshwater fishing trip that much better. Captain James Nelson has been fishing Riverside County Freshwater for over 20 years. Fish with James in Riverside, and you will have the time of your life.